You’re probably aware that OS X is powered by Unix at its core. This core brings a lot of geeky technologies, like memory management and multitasking, that help make the OS X experience so pleasant. But it also brings something else, something with tangible benefits to any Mac user: multiuser support, and the ability to quickly switch between those multiple users. If you’re a parent, you may already be familiar with multiuser support in OS X; you’ve probably created a kids’ account, and set it with the appropriate Parental Controls. (If you haven’t, you should, but that’s another story.) But if it’s just you using your Mac, you may be thinking, “Why do I need multiuser support?” The answer is that there are lots of good reasons to use OS X’s multiuser support, even if you are just one person on one Mac. First, the technicalities. 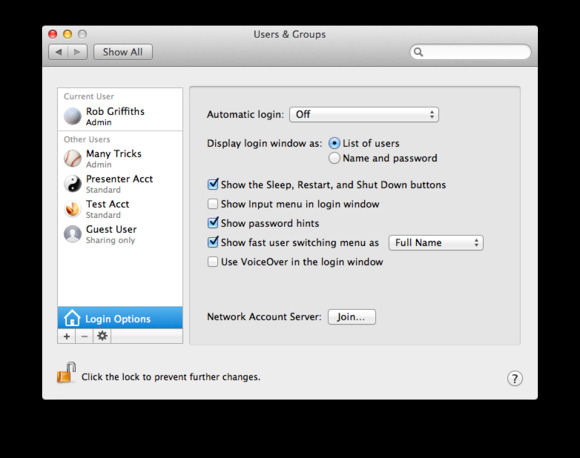 While this isn’t a tutorial, OS X’s multiuser support can be found in the Users & Groups panel in System Preferences; if you click the Login Options button, you’ll see a toggle for showing the fast user switching menu, and in what form you’d like it shown. While multiuser support is the core feature of interest, it’s the fast user switching capability that really takes the cake—especially in OS X 10.8 (Mountain Lion), where the switching is incredibly fast. 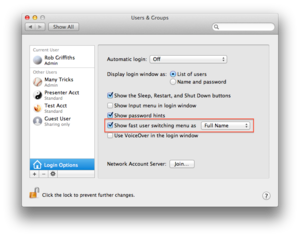 With fast user switching, additional user accounts are but a few mouse clicks away: Mouse up to the menu bar, click the Fast User Switching icon, and choose the account you want to use. Once that's selected, the process of switching takes something under two seconds, regardless of how much stuff you have open in any of the accounts. Great, so you can quickly switch accounts, but why would you want to, especially if you’re just one user on one Mac? Here are a few possible instances for using multiple accounts, beyond the parents-with-kids scenario. Troubleshoot issues: If you’re experiencing issues with an often-used application, you may wonder if the problems are being caused by some add-on program you just installed, or something else that’s conflicting with that application. Creating a clean “test user” account is a great way to isolate such issues. Don’t install any of your usual third-party add-ons in this test account; leave it as plain as you can. When an app misbehaves, switch to your test account, and try it there. If it works fine, you now know the problem is something in your “normal” user account. If the app has issues in the other account, too, then the problem is either systemwide or specific to the app. Give presentations: If you give presentations using your Mac, a presentation account is a must-have. No need to let your audience see your messy desktop, or the contents of your hard drive. Create a presentation account, and use that account when presenting. That way you'll show no messy desktop—only the stock OS X files you want your audience to see. Optimize games: If you’re like me, chances are your normal account is littered with all sorts of useful tools, many of which are always running and sucking up a bit of your CPU power. When you use fast user switching, all those tasks are suspended, and 100 percent of your CPU is available. It probably won’t make a difference if you’re playing Chess, but if you want to play a full-screen, high-resolution, real-time 3D adventure game, you’ll want all the CPU power you can muster. So fast-user-switch to your Gaming account before starting, and that’s what you’ll get. Keep work and personal activities separate: If you use one Mac for both personal and work activities, creating Work and Home accounts can help you stay on task while working, but still keep your personal files away from your work files. Set up your email, browser, etc. on each account with only those things you need for work or home, and you’ll be less likely to do personal tasks while working—or to work when you’re supposed to be relaxing. If you do need to do something, though, fast user switching will have you into the proper account in a couple of seconds. I’ve been using multiple accounts on my Macs for years, and find them indispensable to both my work and my play. If you haven’t tried this feature out, I highly recommend doing so. There’s really no downside (other than a slight increase in disk space used) to having and using multiple accounts.